Due to the Twilight Zone between Christmas and New Year, I am losing the catch-up game, but have just spent a rather wonderful couple of days up at Barrington Tops, camping in the wilderness and being "off the grid"; while I love camping, being off the grid is a rare situation for me. But that's not the story. It's time to look at something I have written about before, and that is where did the globular clusters we see orbiting the Andromeda Galaxy come from? 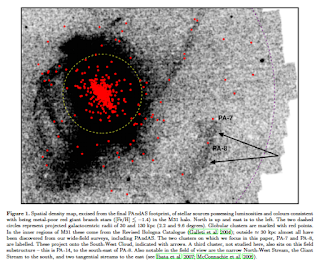 And as you might guess, this is another result drawn from the Pan-Andromeda Archaeological Survey (PAndAS). It's Christmas day here in Sydney, and the rain has fallen incessantly; it feels like when I was growing up in Wales. Anyway, I thought a short post. Over at In The Dark, Peter Coles was talking about the new results from the WMAP satellite, the latest of the probes of the Cosmic Microwave Background; I've mentioned before that I am old enough to remember the results from COBE, especially this front page story. Basically, Peter's article points out that these observations have radically changed your understanding of the Universe. Mind you, looking at the above newspaper, and seeing "Bosnia ceasefire crumbles", tells me that in the same period, humans haven't advanced very far in the same period. Anyway, in the comments, there was an interesting issue raised by Phillip Helbig (hi Phil!). Phillip and I are of the same vintage, and were raised on a diet of VMS before Unix became all pervasive in astronomy. Essentially, it is to do with the coincidence problem. Just for the kids of course! 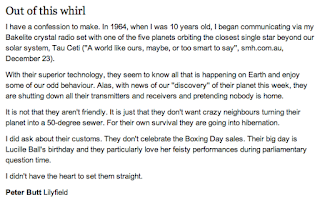 I've written about the Sydney AAO Multi-Object Integral FIeld Spectrograph (SAMI) previously. 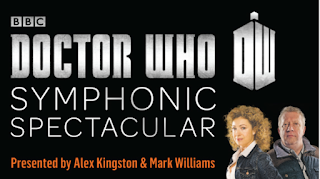 Here's a bit on it that I pinched from James Allen's webpage on it. The concept is simple (but the implementation is not). In the old days, we would do single-slit spectroscopy, where we would collect light from a distant galaxy through a narrow slit, and pass that through a disperser to get a spectrum. This would give us the details of what was going on along that slit (so we could measure rotation curves). Given that the Christmas period is upon us, but the rate of things to do has not declined, and people keep asking me if I have completed my Christmas shopping (no! and in truth, I haven't even started) time for a Scrooge-like post. The following may upset my colleagues, so I will lay my card on the table. I am as guilty as the next person, but I am trying very hard not to be. I no longer want to be a Paratrooper Speaker. And I think my colleague should do the same. Conferences, meetings and workshops have long been seen as an important aspect in astronomy (and a lot of academia). The chance to get together, hear some great talks discuss some good science, meet people and network. A chance for Early Career Researchers to meet some of those names on papers, and see just what is going on. 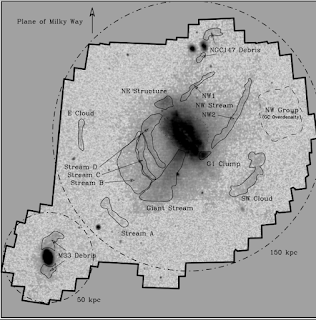 As you know, the Pan-Andromeda Archaeological Survey (PAndAS) is a big program we've been doing on the Canada-France-Hawaii Telescope, mapping out the locations of all the stars in the halo of Andromeda (M31) and Triangulum (M33) galaxies. It's taken a lot of work, but with all the data now in, it's time to squeeze out the science. There is actually a bit of a hurry about this, as in the next year, we are making all of the data public, and even you can write PAndAS papers. What's this current paper about? Well, let's start with the first picture in the paper. Today is a busy day, with the allocation of supercomputer time though ASTAC and the announcement of the 2012 Excellence in Research for Australia, which always leads to robust "discussion", and board of examiners meetings. So, only time for a quick post. A new article in The Conversation on the controversial topic of "Are we living in a Synthetic Universe?". It's called Alert: you may be living in a simulated universe. Given the comments, I could have alternatively called it "Baiting philosophers is easy and fun", but have a read yourself and let me know what you think. Sunday morning. I've got a busy week coming up, having to head to Canberra tomorrow for my induction into the Australian Research Council (ARC) College, then a few board of examiners meetings, the allocation of supercomputer time, and then Christmas drinkies on the Botany Lawn. So a quick post on peer review. There has been an awful lot written on this, and I will focus on academic peer review, especially when it comes to publications. I read this interesting article on peer review, which points out that the press does not seem to understand the difference between a published article, and things written in popular science magazines, on blogs, or simply chatted about down the pub. But before I start, let me remind you how a paper gets published in a journal. It starts by you having your idea, doing your work, and deciding that the results are significant enough to be interesting to everyone else. I am still playing catch up on the papers I've recently had accepted, and after this one there are two more that I have to write up. Today's paper is lead by Dougal Mackey at Mount Stromlo Observatory in Canberra (officially, its name is now The Research School of Astronomy and Astrophysics (RSAA), but it will always be Mount Stromlo to me). The paper is yet another from the Pan-Andromeda Archaeological Survey (PAndAS), and so you know will be a cool result :). Dougal's expertise is globular clusters, balls of a few million stars that orbit large galaxies. If we look at a nice globular in our own galaxy, it looks like this. Yes, those little balls of stars in the middle. Maybe a little less spectacular, but still extremely interesting. Why?